Created by: Alexia Kyriakopoulos, Ari Melenciano, Grau Puche & Regina Cantu. As solar energy excites molecules of chlorophyl pigment in the process of photosynthesis, human existance is constantly being transformed into metadat to develop artificial intelligence. The Metatorium explores the shared naunces between nature and technology and of observing and being observed. The Metatorium is an interactive window display that ran for one week in the corner of Broadway and 10th St. The goal of this project was to make the users part of a reflection on the way we so freely seem to provide our faces to the inanimate creatures that computers are just for the pleasure of being recognized by this apparent magic mirrors. These, the computers, run on databases and "grow" thanks to algorithms created by humans.Open CV, the tool we use to detect faces, finds what it was taught to be a human face. When an action performed by another person would be considered innapropiate is set by a machine we watch with awe and let ourselves take part of the interaction. Human Computer Interaction. This is the flow with which we designed this installation. Two main cameras look at the audience, one is looking for faces, the other one is translating movement into color. Behind the main camera there is a program runing which takes a picture every five seconds. 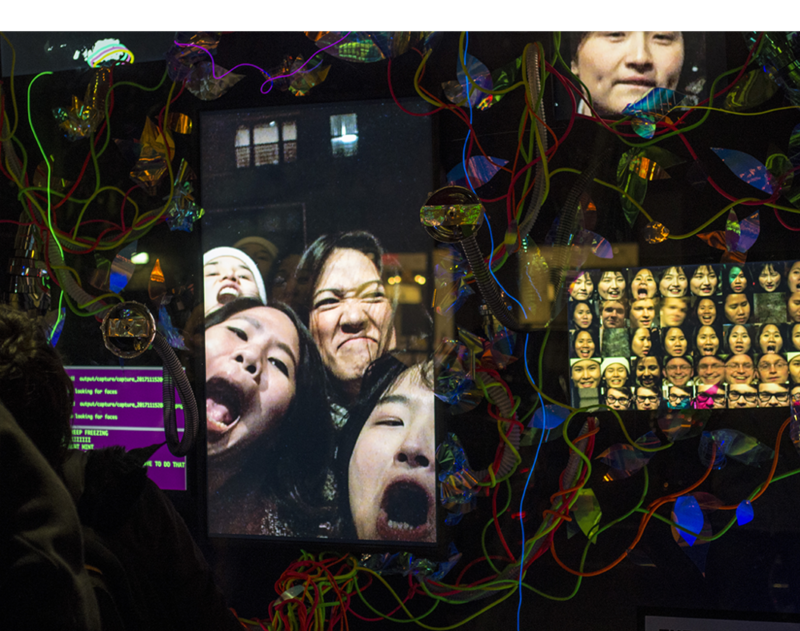 From each picture the program looks for a face and if it finds it, sends a signal to the arduinos to light up the installation as it also isolates the face and places it in a collection. In order to communicate the concept clearly we set a "Code Screen" where the flow of the program could be monitored. It was during the opening day that Grau discovered that through the server he had set up to watch over the installation he could open a division in the terminal window showed on this screen. And decided to use said division as a chat box open towards the public. The result of this almost accidental adition was a magnificent interaction that gave us a chance to bring The Metatorium to life. And to feel, to a certain degree how it feels to be a lonely computer with only one eye. Then The Metatorium plant-like organism. With iridescent leafs, light producing branches, and screens as flowers. Which harvested 144014 images through 6 days of interactions, time that for some of our most avid users (this building is a dorm building) "was too little".